Beautiful & spacious light filled large 1 bedroom 2 bath condo has been updated. This contemporary kitchen rehab with custom cabinetry, a gas range & glass tile backsplash sets the scene for culinary delights! Neutral ceramic tile flooring & carpeting throughout. Newer lighting and bathroom updates. Main floor condo location that you can enter from lobby, garage or walk in patio door. Large window in breakfast nook. French door (walks out to private patio) & matching window flank brick fireplace with gas log. Combo Living Room / Dining Room plus separate entry from main hallway. Large master bedroom (20' x 15') with full bath & a double walk in closet. Half bath powder room located in hallway. 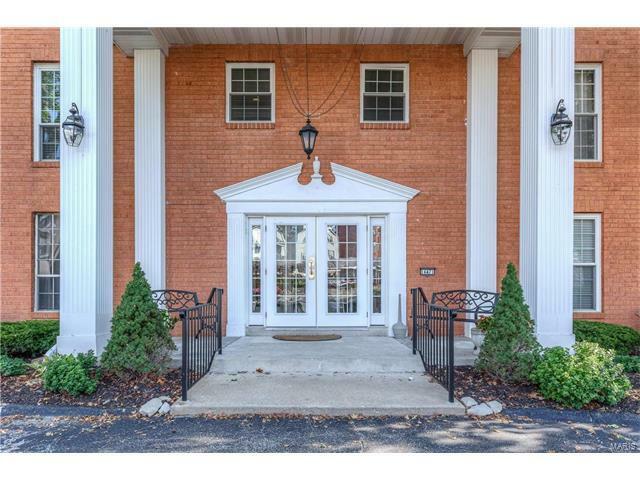 Secure building & garage with elevator up to the first floor from entry lobby. In unit laundry room has Maytag stacking washer & dryer + tons of storage space. Common area amenities include POOL, Gazebo, Patio, Clubhouse, garage parking space, Secure lobby entry & mailboxes. Lovely & efficient! I-40/64 to 141/Clayton Road exit...South on 141, exit west on Clayton Road to right into Village Green, right at stop sign, to circle drive on left.